Working directly with clients to determine their needs and budget, a Benefits Consultant can assist in determining which tax deferred annuity arrangement is most appropriate. IFG can assist companies and individuals in setting up a comprehensive retirement plan, which may include options such as tax deferred annuities. Working directly with clients to determine their needs and budget, a Benefits Consultant can assist in determining which tax deferred annuity arrangement is most appropriate. Businesses and individuals who work with IFG will be better able to plan for their retirement, as they will understand the full range of retirement plans available to them and can make an informed choice as to which options will suit their requirements. Annuities are a contract between a policyholder and an insurance company. The owner of the contract pays into the annuity, and in return, the insurance company provides payments on a particular schedule. There are two main parts of the annuity contract. First, a policyholder invests in the annuity, building up the funds. Second, the company pays the owner on a prearranged schedule. In most cases, an annuity provides a death benefit similar to a life insurance contract. This type of plan is subject to both state and federal regulations. There are two main types of annuities: fixed and variable*. A fixed annuity provides a fixed rate of return. It is predictable, stable and begins on a certain date. The insurance company directs the investment of a fixed annuity. In contrast, a variable* annuity does not have a fixed rate of return. The annuity’s funds are typically invested into separate accounts which in turn invest in mutual funds. While income is not guaranteed or predictable with a variable* annuity, it has a higher potential rate of return for investors as a trade off for the increased risk. Annuities can be paid in a number of ways, with the two main options being a lump sum payment, or multiple payments over a period of time. A lump sum payment is straightforward: an investor in a tax deferred annuity receives a single payment of the account’s full value. If a policyholder chooses to receive payments, he or she will then choose how long they will receive the payments. The biggest advantage of an annuity as a retirement plan is that for individuals, it defers income taxes on all of the contract’s gains. The owner of an annuity is only taxed when he or she receives distribution, which typically happens during retirement—when the owner has a lower income and will be taxed at a much lower rate. This while true for a partial withdrawal is not true for annuities. Unlike other types of retirement accounts, such as 401(k)s, there is no limit on contributions to an annuity, and no specific restraints on withdrawals. An account owner does not have to wait to withdraw money until retirement, however, just like IRA and other qualified plans they may be subject to a premature penalty if the policyholder is under the age of 59 and a half. This has the potential to significantly increase the tax advantages of an annuity, as a larger amount of money can be invested and the taxes on its growth can be deferred to a later date. Annuity contracts can be complex, with many options available and a variety of options for setting up investment and payments. IFG can work directly with individuals and companies to help them choose a tax deferred annuity that will help them plan for retirement. 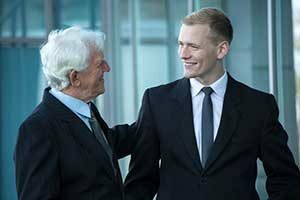 This includes educating clients on the choices available and the pros and cons of each type of annuity. Picking the right tax deferred annuity with the assistance of IFG’s Benefits Consultants may help maximize retirement savings, help minimize taxes, and assure a steady stream of income, depending on the type of annuity chosen.